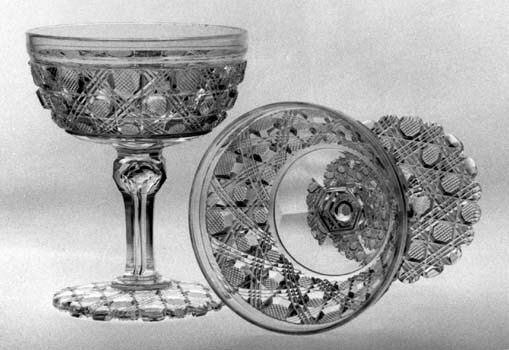 One of the most popular of the nineteenth century cut-glass motifs is called cane in this country today and alternate panels in Great Britain. Three different designs are described here in what can be thought of as members of the cane family. All three are produced by four intersecting sets of parallel miter cuts. 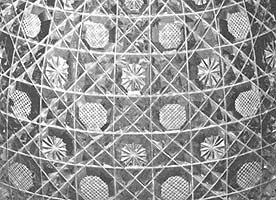 The cut-glass version of the “standard,” or double-mitered, cane motif or pattern — the one most frequently seen — probably originated in Bohemia during the middle part of the century and is based on an Islamic design. It became especially popular in both this country and England during the 1880s. The design may also possibly have been inspired by the woven pattern of cane that was used, and is still used, for chair seats; in fact, an alternate name for cane is chair bottom. [Cane] consists of pairs of mitred diagonal grooves cut at right angle by another series of such pairs, leaving an uncut space between the diagonal pairs of grooves so that a flat area results, and then cutting horizontal and vertical grooves so as to make the flat areas or “panels” octagonal (or square with chamfered corners) in shape. Two further points added by Newman are, unfortunately, incorrect. It is not true that the “octagonal areas” were “never further cut,” Hawkes’ Cairo pattern, for example, places single stars on the “octagonal areas.” Nor is there anything particularly “Irish” about decanters that were cut in the cane pattern. When cane-cut decanters, often used in tantalus frames and frequently square in section, became popular in the late nineteenth century, the Irish trade in luxury glass was virtually non-existant. The “octagonal areas” are octagonal hobnails. J. Hoare & Company used this name as Oct[agon] Hobnail (as well as Chair Bot[tom]) in its catalogs and listings of patterns. Boston & Sandwich and L. Straus & Sons followed suit. C. Dorflinger & Sons, on the other hand, called the cane pattern Hob[=Hobnail] Diamond & Lace, while Hawkes simplified this name to Lace Hobnail. Mt. Washington/Pairpoint called cane 2 Cut Oct[agon] Diamond and cut strawberry (fine) fine diamonds on the octagonal hobnails, as did Hoare sometime after 1900; Hoare called the resulting pattern Harvard. 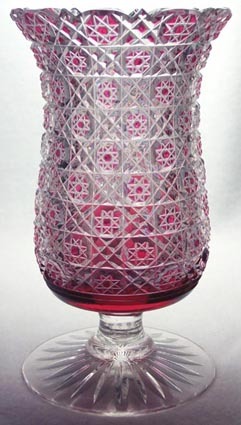 Today, by general agreement, whenever the octagonal hobnails in double-mitered cane are cut with strawberry (fine) diamonds alternating with single stars, the motif or pattern is called Harvard, another generic design and one that is commonly found, especially on glass cut after after c1900. It obviously differs only slightly from Hoare’s Harvard (see “The Harvard motif/pattern” below). LEFT: A celery vase cut in the standard (double-mitered) cane motif/pattern. Cyclindrical with square top. 24-pt star base. Probably 1880s or early 1890s. H = 6.75″ (17.1 cm), wt = 1.25 lb (0.6 kg). Sold for $100 in 1990. RIGHT: A tumbler cut in a different version of the cane motif, with fans added. This is an example of green cut-to-clear glass. Manufacturer unknown; probably early twentieth century (Image: Internet). Two views of a spoon holder (spooner) on a short, uncut pedestal; red cut-to-clear glass. Middlesex-type hobstars are cut on the cane’s octagonal hobnails. 24-pt star on foot. H = 7.5″ (19.0 cm), top rim D = 4.25″ (10.8 cm). The spooner has characteristics typical of the Dorflinger Glass Company, c1880. This company called the bowl’s shape “English”. Offered at an eBay auction in Mar 2003 where it failed to sell and was “bought-in” at $813.53. It was re-offered in May 2004 and again failed to sell. This time at $486.53. In May 2005 this pattern in colorless glass, but in triple-mitered cane, was found in Woodward 1978 (p. 39). This suggests that the following item could have been produced by Thomas Webb & Sons, England. 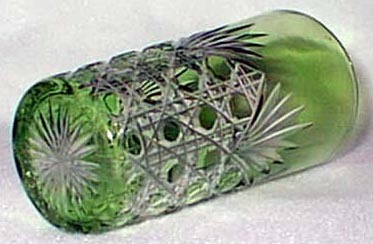 Webb’s extensive collection of cut-glass patterns have yet to be published. The Harvard pattern, a variation of standard cane, was first identified by Dorothy Daniel as one of her “fifty patterns” of the Brilliant Period. 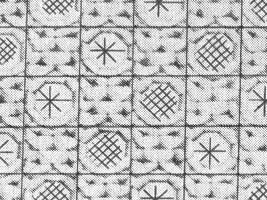 As shown in the above examples, the pattern, which is also regarded as a motif, is identical to cane except that the hobnails are decorated with both strawberry (fine) diamonds and single stars. The third “square” is occupied by the double-mitered-X that is part of the standard cane motif. The examples show all three of these elements that make up the motif/pattern: strawberry (fine) diamonds, single stars, and double-mitered-Xs. (For a quick ID, count the number of elements; there must always be three. The strawberry (fine) diamonds and single stars may be arranged horizontally (vertically) or diagonally.) Harvard was defined in this form by Pearson (1965, p. 66) as a generic motif/pattern. It is commonly found as a motif in post-1900 patterns, especially those, after c1910, that contain realistic (floral) motifs. These patterns are often found on “figured” blanks that are finished with rather obvious acid polishing. If a motif/pattern has three elements but the decorations on the hobnails are not strawberry (fine) diamonds and single stars, then the motif/pattern is regarded as a Harvard variation. If the motif/pattern has only two elements — for example, strawberry (fine) diamonds and double-mitered-Xs — then the notif/pattern is considered to be a cane variation. But there are a couple exceptions: J. Hoare & Company introduced a pattern it named Harvard about 1906-9 (Spillman 1996, p. 43) where all of the hobnails are cut with strawberry (fine) diamonds. And while Pairpoint cut the standard (generic)Harvard pattern, the company called it 2 Cut Octagon. Pairpoint also used this pattern name where all of the hobnails are cut with strawberry diamonds. Once the manufacturer of a pattern is identified, then the name to use is the one the manufacturer has chosen. Patterns called Harvard by other companies bear no resemblance to Harvard or its variations. Probably the most well-known of these patterns is Libbey’s Harvard. The pattern was in production at the time the company moved from E. Cambridge, with Harvard University near-by, to Toledo in 1888. Daniel writes that the Harvard pattern “should not be confused with the old Russian pattern” (p. 269). Indeed, it should not! Beginning collectors sometimes make this mistake, and they also tend to confuse Harvard with standard cane, sometimes going so far as to call the motif “chair bottom,” an informal term that should be reserved, if at all, for the cane motif. Cane is often cut on such a small scale that it would be impossible for the cutter to cut the strawberry (fine) diamonds and single stars on the hobnails that are required for the Harvard pattern. The second member of the cane family substitutes a single-miter cut for the double-mitered parallel cuts. 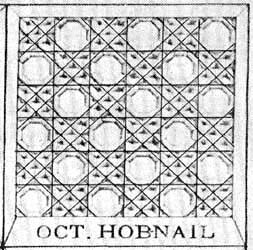 As a result there are no octagonal hobnails and no double cross-cut “squares” — only open and cross-cut “squares” (blocks or diamonds). In the following example, the pattern has been “cut large” (i.e., coarse). It is more often seen miniaturized and used as a motif, as has been illustrated on items that were designed by Frederick Carder in Stourbridge, England in the 1880s. Decanter cut in the (single-mitered) cane motif/pattern. The Mt. Washington Glass Company called this pattern Alternate Block Diamond (Coarse). 16-pt star base. Original stopper has an air trap and is cut in-pattern. c1880. H = 11.5″ (29.2 cm), wt = 2.5 lb (1.1 kg). Sold for $150 in 1990. The third member of the cane family uses triple-mitered parallel cuts. It has an interesting Anglo-American history. Thomas Webb and Sons of Amblecote, West Midlands (UK) cut this pattern as No. 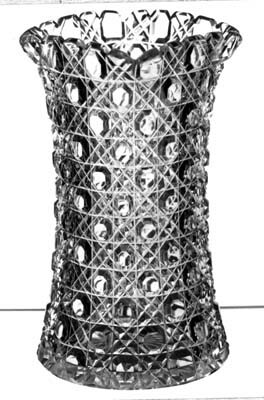 12,140, “datable to 1880,” according to Hajdamach (1991, p. 363) who shows both a pattern drawing and an actual example on a red cut-to-clear wine glass. In Webb’s pattern No. 12,140 the octagonal hobnail is cut with a simple 8-pt “Middlesex” hobstar. The stem is cut with hollow hexagons and the foot, with sixteen scallops, is cut in-pattern. This item could easily be mistaken for American, except that the example shown is not cut as deeply as was American work of the period. When T. G. Hawkes & Company sent its cut glass to the 1889 Universal Exposition in Paris, the shipments included pattern No. 3708 which was a “new” pattern at that time (according to Spillman 1996, p. 186) and which is shown below. This pattern is identical to No. 12,140 except that the simple hobstar has been replaced with strawberry (fine) diamonds. Note that Hawkes also scallops the foot and cuts it in-pattern. Pattern No. 3708 must have been a popular pattern as it is shown, on a compote, in a Hawkes catalog dated c1902. Champagne glasses cut in (triple-mitered) cane. Pattern No. 3708 by T. G. Hawkes & Co. Probably 1890s. H = 4.4″ (11.2 cm, top rim D = 3.7″ (9.4 cm), wt = 0.6 lb (0.3 kg). Set of six sold for $800 in 1989. C. Dorflinger & Sons also cut a triple-mitered cane pattern, based on Webb’s pattern (if, in fact, Webb originated the pattern). Dorflinger rotated the pattern 45 degrees and replaced the “Middlesex” hobstar with a 12-pt “Brunswick” hobstar and called the pattern No. 210. It is found in the “first source catalog” that forms part of the composite catalog C. DORFLINGER & SONS, FINE CUT GLASS (Published by the American Cut Glass Association in co-operation with The Dorflinger Museum and The Rakow Library of The Corning Museum of Glass, 1997). Pattern No. 210 was, therefore, first cut sometime before 1890. Other American companies also cut triple-mitered cane. Pairpoint called the pattern 3 Cut Octagon Diamond, and it is similar to Hawkes’ pattern No. 3708. J. Hoare & Company used the basic triple-mitered cane design for its Kohinoor pattern (c1911) which was also cut by the O. F. Egginton Company (pattern name unknown). And there are other examples.